It takes a unique type of talent to specialize in educating today’s youngest students, and that talent can be used to make a difference in the numerous types of jobs available with an elementary education degree, according to the US News and World Report. While commonly thought of as a degree for pre-school or kindergarten teachers, the truth is that elementary education professional are found in all kinds of positions that actually extend beyond early childhood programs or traditional elementary schools. Those students who are looking into programs in this field might be surprised to learn of the various places where their talents will make a real difference for students and parents. Though many people in pre-school programs seek early education degrees instead of elementary education, an increasing number of state-funded pre-school programs actually prefer candidates to have an educational background in elementary teaching skills. That’s because they’re often employed by elementary schools and many of these teachers full multiple roles at differing grade levels throughout the typical workday. For this reason, those who wish to be more versatile and marketable to pre-school and early childhood education employers should opt for a four-year degree in elementary teaching. Of course, the most common position sought by those with a degree in elementary education is simply a full-time teaching position in an elementary school. These schools often serve kindergarten students and those in first through fifth grade, and teachers are responsible for teaching the full range of academic subjects required of each district. Teachers in this role must be great at handling the personalities of young students, and they must have well-defined classroom management practices that keep behavior in line even on more exciting days. Teachers will be responsible for guiding their students toward state standard compliance in this role, with many states requiring standards testing as early as third or fourth grade in order to set a baseline for future exams. While middle school might seem like an odd place for a teacher with an elementary education degree, it’s worth noting that most states break down their education licenses as being either for K-6 or grades 7-12. This means many elementary school education graduates can fill positions teaching a specific middle school subject area, as long as they have the skills necessary for basic math, English, language, or other skills. Middle school positions, like their elementary counterparts, do require state standards testing and will see teachers working with students on more content-specific standard achievement throughout the year. 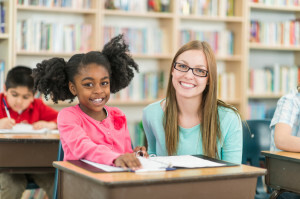 For those teachers who wish to seek part-time work in the field, or those who are gaining valuable work experience in advance of seeking a full-time teaching position, work as a substitute teacher can be very rewarding. These positions give teachers time to harness and focus their skills in classroom management, direct teaching, learning activities, and more. They’ll also be able to determine which grade level most aligns with their set of skills and the classes required of their degree program. Elementary education professionals are vital in a world where formative experiences can determine long-term student success. The types of jobs available with an elementary education degree reflect this, giving teachers the ability to guide students through pre-school, elementary school, and even the first half of middle school.